Henry Huttleston Rogers was born in Fairhaven in 1840, the second of three children of Rowland and Mary (Huttleston) Rogers. As a boy he delivered newspapers, worked as a grocery clerk and was baggage master for the Fairhaven Branch Railroad. At the age of twenty-one, he left Fairhaven for the oil fields of Pennsylvania, where he and a partner, Charles Ellis, started their own oil refinery. 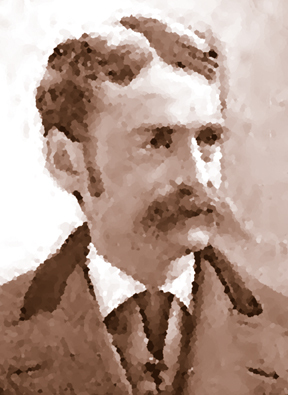 Later Rogers became manager of the Charles Pratt Oil Co., which merged in 1874 with the Standard Oil Company. Rogers eventually became president of six and vice-president of thirteen of the Standard Oil Trust companies. As the right-hand-man of John D. Rockefeller, Rogers was one of the most powerful businessmen in country. He was also connected with U.S. Steel, Amalgamated Copper, and several gas companies and railroads. Near the end of his life he financed the 500-mile Virginian Railroad at a cost of $35 million. Rogers married his high school sweetheart, Abbie Gifford, and summered in Fairhaven with his five children. After Abbie died in 1894 at the age of 53, Rogers married Emilie Augusta Randall Hart. In 1895 he built a large mansion near Fort Phoenix in the southern part of town overlooking the bay. Most of this house was demolished in 1915 and none of the main house is left today. In 1885, with the building of a grammar school, Rogers began a series of benefactions to his hometown, giving Fairhaven some of the most beautiful public buildings in the country. Besides the spectacular architecture gracing the town, Fairhaven has Rogers to thank for its public water system, roads, and Cushman Park, which was a boggy pond before Rogers had it filled and landscaped. 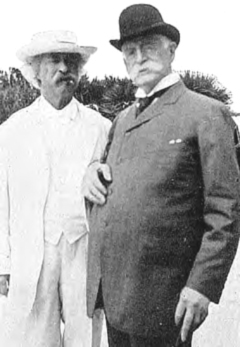 Rogers was a close friend of author Mark Twain, who often visited the Rogers family in town, frequently arriving on Rogers’ 225-foot steam yacht Kanawha. At Twain’s suggestion, Rogers gave financial assistance to Helen Keller, who dedicated one of her books to him. Rogers also provided Booker T. Washington with funds for the establishment of schools for southern blacks. At the time of his death in May of 1909, Henry Huttleston Rogers was worth between 100 and 150 million dollars, placing him at number 22 in the list of the top 100 wealthiest people in American history. His fortune, adjusted to today’s dollars, would be worth more than $40 billion. A monument, which now stands on the west lawn of Fairhaven High School, was dedicated to Rogers in 1912. Click on the links below to learn about Fairhaven sites associated with Henry H. Rogers. The Fairhaven Office of Tourism offers regularly scheduled Henry H. Rogers Walking Tours from June through October.